This is so cool. 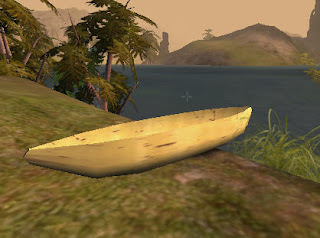 I've got a canoe IN GAME. It's probably one of the most basic vehicles you could imagine, and it's using a default texture while based completely on CMAN's Viper code, and it has no weapons(! ), but it works. Well, it needs a little tweaking as you can tell from the pictures - I have no clue why the driver is floating three feet above, plus I need to export it as a staticmesh so I can see the factory in the editor, but other than that, it does what a canoe should. And for that, I am a Happy Winkyboy.